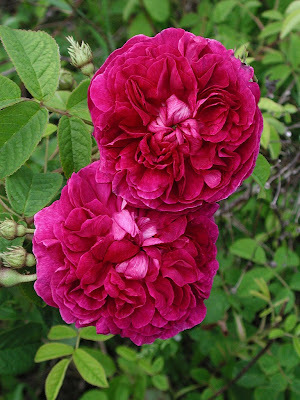 A seedling from around 2000: 'Charles de Mills' X 'La Belle Sultane'. It has been nicknamed "Farside deMills", a name that distinguishes it from its neighbors, by proximity. This is a once-blooming hybrid, suckering growth habit, making an ever-widening thicket of 3 foot tall canes. You can see the influence of 'La Belle Sultane' in its Damask-like sepals, while the bloom form is clearly that of its seed parent. A lovely thing, although it has languished in test bed #1 for many years, having been disqualified for commercial purposes. (too hasty, perhaps?) Maybe I ought to auction off naming rights....hmmm. I think breeding these very old Gallica is a wonderful thing. This one is beautiful, Paul. I feel more once-flowering roses should be bred and introduced to bring back the seasonal garden... why is it we accept once flowering azalea and yet insist our roses be perpetually in bloom??? I bet this rose is pretty bomb-proof too. I put 'Ebb Tide' onto CdM the other day and have been splashing 'Tuscany Superb' pollen around too. At a time when Downy Mildew is knocking me for six (an Aussie colloquialism ;) ), the Gallica are entirely unaffected. How much health do you think we sacrifice for the sake of remotancy? Sorting through my photo library.